Hemispheric Conversations: Urban Art Project, Public Debate – Caitlin Frances Bruce, PhD. Last I wrote, I was finishing field note writing for a research trip to León. This past week (10/6-10/8) I, along with my collaborators (Oreen Cohen and Shane Pilster) co-organized a set of events designed to spur conversations about the relationships between Chicago, Pittsburgh, and León in terms of urban histories, graffiti practices, and post-industrial and hemispheric exchanges. The first event was a public debate, co-sponsored with Pitt’s William Pitt Debating Union around the them: “Should Pittsburgh have legal walls?” The second was a day-long symposium bringing together scholars and artists from Milwaukee, Chicago, Pittsburgh and Mexico to discuss the theme of post-industrial graffiti histories and futures. In what follows I offer a summary of the debate, hoping to create some themes for further discussion at our next set of events in the spring, a public lecture by Dr. Jessica Pabón about feminist masculinities in graffiti and the hip hop diaspora, and a series of free workshops for youth led by Chicago artist Stef Garland and Leonese artists Kif, Nikkis, and Wes in collaboration with Pittsburgh organizations and artists (TBD). I will soon write a follow-up post about the symposium. Participants included Detective Alphonso Sloan from the Graffiti Task Force; Shane Pilster, graphic designer, Urban Art Tour organizer at Carrie Furnaces, and graffiti artist; Mike Mook, tattoo artist, father, and former graffiti artist responsible for the “Mook Law”; Steve Root, a retired psychotherapist and social worker, who is a volunteer with the South Side Graffiti Council and the South Side Community Council Graffiti Watch (GW); Jason Mendez, our moderator, an educator, author, and interdisciplinary theater artist and parent, who is part of the project Sons of the Boogie; and myself, an Assistant Professor of Communication at the University of Pittsburgh with a research program exploring transnational legal graffiti. We also were aided by the efforts of the William Pitt Debating Union public debaters; Christ Talbot, Toey Yi, and Aaron Hill, who asked some very smart and incisive questions. We began with each panelist offering a short introductory statement. Jason Mendez discussed his work with Sons of the Boogie, which included famous and foundational writer Phase 2, who was a master of styles and pioneer in bubble letters, which later provided a platform for artists like Jean-Michel Basquiat. Importantly, Mendez explained, Phase 2 distinguishes between the term writing and graffiti. He would call graffiti the ‘g-word’ instead preferring writing which points to the communicative, aesthetic, and public richness of the art form. This is a positioned sustained by many in the aerosol writing community, for example, Desi Wome in the Bay Area. Mendez continued to discuss Phase 2’s role in creating the first graffiti zine, International Graffiti Times, which explored the essence and internal dynamics of the culture. He is currently working on a memoir about growing up in the South Bronx, how it figured as home, and the current risks of gentrification as many lose home and history, or of representational elisions, in such media artifacts like “The Get Down,” which, Mendez cautioned, romanticizes the 1970s and 1980s in the Bronx. Detective Sloan opened by highlighting the fact that we was a writers between the ages of 13 to 21 or 23, stopping when he began working for the city as a police officer. He argued that he supports urban art, and public art, which can support knowledge and education. Pittsburgh had a legal wall in the past, he argued, along the Eliza Furnace Trail, otherwise known as a the Jail Trail. The hope was to offer artists an outlet and to contain graffiti. “It had the opposite effect,” Sloan lamented, explaining that in the early 2000s Pittsburgh saw a spike in graffiti, and artists would come to paint the permission wall but would also “paint everything on their way in, and on their way out.” He noted that he respects artists like Basquiat, Ecko, and Keith Haring who learn how to transition into legal and commercial venues, like graphic design. Steve Root opened by defining the South Side Community Council’s work, and how they began to deal with issues of graffiti. He isolated “long term working class property owners” as the primary victims of graffiti vandalism, and that such writing functiosn to devealuetheir property values, and there is a legal system that fails to hold writers responsible. The Graffiti Watch (GW) seeks to take responsibility as a community and send the message that the South Side is valuable. Preventing vandalism, Root continued, is an ongoing process, and he had no illusions that graffiti could ever be eliminated. Instead, it is a dialectical relationship with taggers, an ongoing and sustained effort. He noted, however, that through conversations with Shane Pilster and learning more about the culture, that graffiti involves intense feelings of place, and empowerment, and being creative such that the current polarized relationship between writers and GW does not accomplish goals of inclusion. He was interested in the Rivers of Steel project, and had also studies legal walls in Toronto, Montreal, Quebec and Wynwood Walls. Moreover, he acknowledged that buffing is its own form of graffiti and censorship. It takes place in the idiom of graffiti, arguably. Instead, he was moving towards a model of ongoing conversations with the goal of aachieving mutual respect. In that spirit, GW has enlarged its focus. They want to support creativiting and inclusion, to celebrate diversity, perhaps in the manner in which property owners have transformed the Fox way on 20th and 21st street. Shane Pilster discussed how he arrived in Pittsburgh in 2004 and soon after was arrested for illegal graffiti. He had started writing in San Francisco between 1998 and 1997. He was required to do a lot of community service, the result of which is that he now considers himself more of a “reformed artist” and has been meeting with community groups. This point was later developed in the debate as a discussion about more effective penalties—the idea was raised that community service was particularly important because it helps the writer actually know the communities that they painted in/on, perhaps fostering more mutual understanding. Shane emphasized that the history of graffiti is not just tags but it is an art form that spreads through spaces, and creates opportunities. However, in Pittsburgh, people don’t get to see a lot of really aesthetically elaborate pieces. This is partially due to a lack of legal walls. There might be one in Homewood, but that is it. Instead, to foster dialogue between writers and communities it is important to have several locations, an art walk even, giving a voice to all sides: the public, business owners, and artists. This, he concluded, offers a middle ground that can work with everyone. Mike Mook spoke next. He started writing in 1998 and was extremely prolific until 2001. He was arrested for lots of writing, and has since stopped doing illegal graffiti. Now he serves as a sort of liaison between active writers and offering them legal options. He spoke of his aspiration for the South Side to turn itno something like Wynwood Walls at Art Basel. b) How this concept is flawed, and even dangerous. I think I will dedicate a separate post to elaborating this argument, particularly with regard to Pittsburgh. After the introductions Jason Mendez led a structured discussion. He first asked about the stigmas that writers face. Shane remarked that “most people see the ugly stuff” and don’t understand that writing culture has many facets, such that the tagging is largely the “fame based” part of it. Most of the public, he lamented, are not educated about the “better end of things.” They don’t understand that some street art can actually increase property value- like that of Barry McGee. He also lamented how the media will lump together writing with gang graffiti, or political graffiti, assuming all are the same, whether done by a toy or a vandal or someone else. Mook pointed out that graffiti is a “broad term” that doesn’t capture the nuances of the diversity of hand styles out there. Mendez also asked Detective Sloan about stereotypes about law enforcement that he encounters. Sloan remarked: “There is a sketchy line between public art and graffiti art—you can have public art on walls, like the Sprout Fund murals, and we won’t prosecute that. 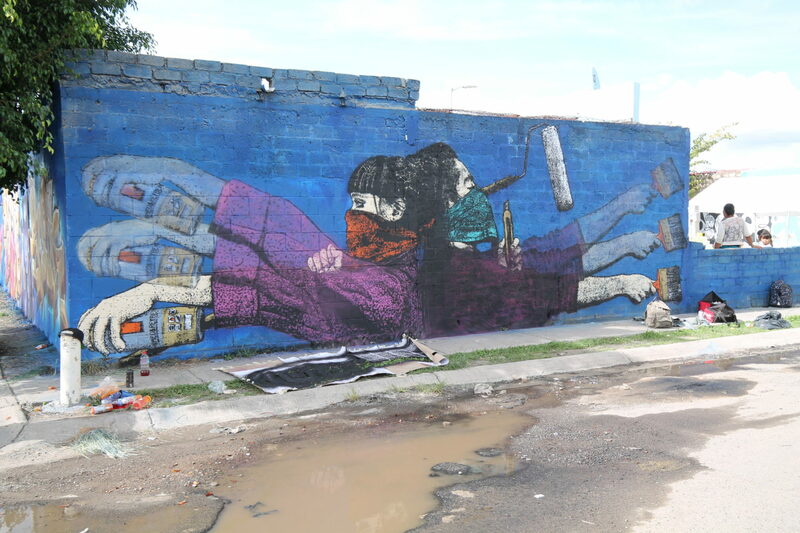 We do prosecute people who paint without permission.” He also noted that there are ordinances for people who allow graffiti to remain or occur on their property. There is a seven year statute of limitations for graffiti crimes. Mook also spoke to the question about treating writers with no priors like violent offenders, and here we had a really interesting discussion about proportionality and alternative options for legal response. He pointed out how, when a lot of young writers are prosecuted, they are pressured to admit to the felony charges to avoid jail time, not really understanding how that felony record will impact them later in life. Shane added that it is a proportionality question, that often writers can get more jail time than violent offenders. A better alternative, he suggested, is for writers to work in the communities where they painted rather than being sent to jail, because in working with the communities, they will be better understood as human beings and neighbors. Detective Sloan responded that they try to “work with” offenders. And if the offender is willing to work with them, and is remorseful they do not push for felonies. “100 misdemeanors does not add up to a felony,” he emphasized, but instead pointed to a “formula” they had developed based on the Graffiti Blasters’ costs, which is that damage is $300 for the first square foot and $50 for every subsequent square foot of damage. We learned later that these fines are higher if the paint is higher up and harder to reach (to clean). Once there is over $4,000 square feet of damage it becomes a felony. Felonies are usually applied, he said, when it is a repeat offender. Moreover, they do not prosecute for every piece done, they usually stop at a certain point because they could reach the millions soon, so, for example if a writer has done “75 pieces we will usually charge them for up to 50 and then stop.” GEMS, a young CMU student who was arrested months earlier had initially been fined over $100,000, but they negotiated the fine down to $38,000 and reduced his felonies to misdemeanors. Montana, on the other hand, who did not work with the police and and had re-painted when on probation is going to be finedn up to $700,000, because of lot of damage was to private homes. Responding to Detective Sloan’s claim that the Eliza Furnace Trail wall caused an increase in graffiti both Shane and Mook pointed out that there was a spike in graffiti all over the US, because it was a time in the early 2000s where instead of trying to go “all city” writers were vying to paint “all country,” to get their name up everywhere. So there was a lot of travel for the explicit purpose of bombing. Though permission walls wont stop all graffiti, Shane added, by having older more established writers painting there it functions as a draw, where younger writers will want to watch, learn, and work with them. Back in the day there was less direct communication, mostly only Myspace. Mendez also asked Sloan about being an artist of color when he did graffiti. Sloan noted that when he was painting, especially along the Busway between 1983 and 1984, most writers were young black kids, but also that there was a code and they did not paint on private property. The Stanton Heights Mall was one of the first places where they did graffiti. Mook added that class differences matter, because the impact of being prosecuted hurts poorer youth more than wealthier ones. One of the Pitt Debaters, Chris, asked Shane and Mook if, given that a lot of writers see graffiti as rebellion, will legal walls satisfy that need and the thrill-aspect? Both laughed and said no. Root added that “illegal graffiti has a purpose” enabling a “sense of belonging and a means of expression.” Shane and Mook also addedthat it is not all or nothing- his work with Rivers of Steel since 2012 shows how dialogue is key, and once they opened space and spoke with writer there was much less dialogue- only 10 instances of vandalism in 4 years. Debater Toey asked about proof for the broken windows thesis, and how Sloan distinguishes between graffiti and art. An interesting distinction that emerged was that, according to Sloan, anything done in aerosol could be considered graffiti, even if it was image-based. Moreover, he cited a city ordinance that bans the deployment of large letter-based work in public. He did not respond to the question about broken windows theory. Aaron asked about how de-stigmatize graffiti. Many pointed to education, Root said that it was important to know the difference between the “junk” and “genuine art”; Shane references his work with Hip Hop on Lock, using educaton to bring publics, communities and schools together. Sloan noted that he doesn’t hate the art, he just hates where it is painted. Root argued for a policy and procedure liaison with respect to graffiti in each neighborhood, because, he argued, each neighborhood has special needs and their character and culture are distinct. He called for communities to take responsibility by addressing the big picture: race, class, and the development process, appreciating different motives. In this debate panelists raised interesting questions about the difference between “clean” and “messy” walls, activating implicit questions about what the value (or threat) of “messy” walls are. Moreover, it pointed to how the law, as written, offers crude distinctions between “graffiti” and “art” mainly based on medium (aerosol vs. brush) and style (letters vs. images). Of course, these distinctions do not acknowledge the complexity and nuance of contemporary writing culture where aerosol can be used to create images, and where (as it has always been the case) hand styles, lettering, involves high levels of artistry and skill. Finally, what was interesting was how the current law incentivizes property owners to act aggressively against graffiti because they get fined for having it on their walls. This element of the Pittsburgh ordinance (last updated in April 2016) pits property owners against writers, making dialogue or collaboration less likely. The ban on text, too, acts as a barrier for permission and commissioned works on private laws. Crucially, the law is not fixed. It is made by humans, and it can be changed by humans. The question is, what kind of social model do we want it to reflect? What kind of art cultures do we want to create?